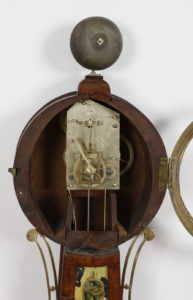 Aaron Willard Jr. Patent Timepiece or “Banjo” Clock, No. 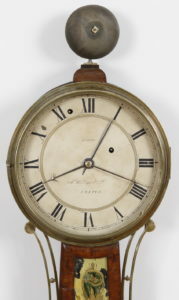 2080, Boston, Massachusetts, c. 1820, Roman numeral painted iron dial signed A. Willard, Jr./Boston/No. 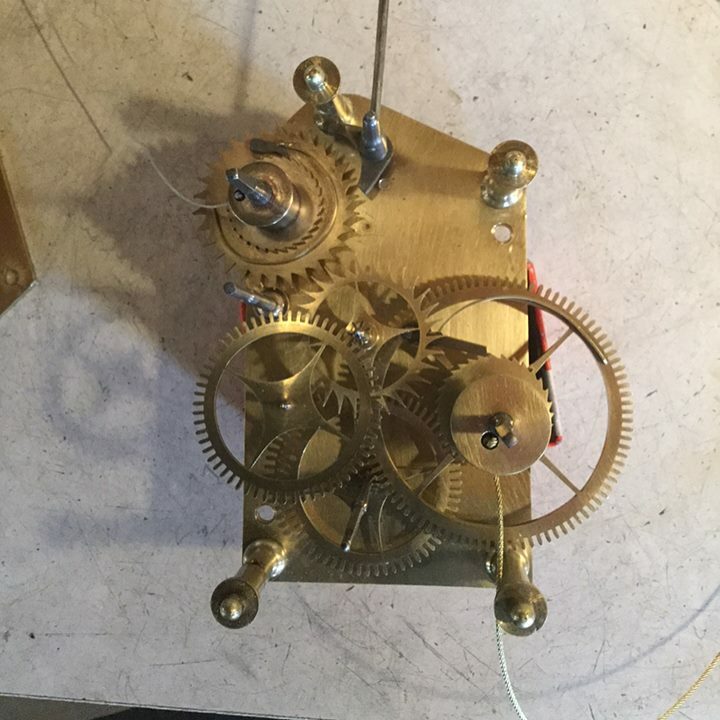 2080. 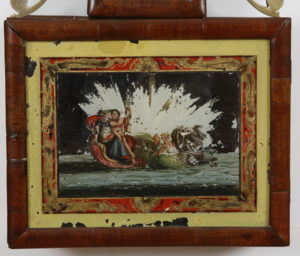 The Mahogany half round “torus molded” frames retain their untouched original mythological reverse glass tablets. 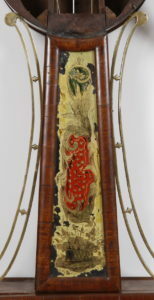 The throat frame flanked by cast brass side arms with glass tablet decorated with gilt leaf, basket, and field of stars design on a red ground. 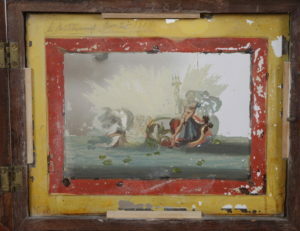 The lower box glass depicting Poseidon and a maiden in his sea chariot pulled by two mythological sea creatures. 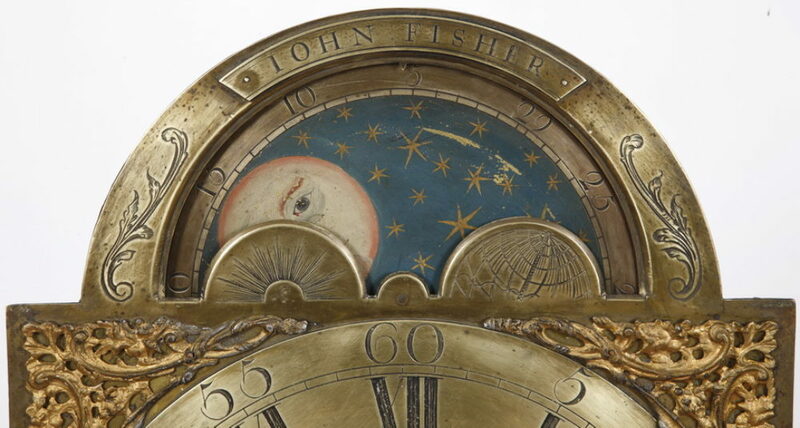 Towards the end of the Federal period clockmakers in Boston adopted the practice of “die stamped, numbered case” parts in their work. 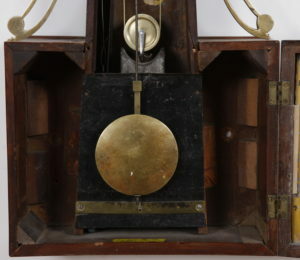 In this example, the case & frames are numbered “734.” The works are eight-day time and integral alarm movement with original (narrow) lead weight with “duck bill” hook and pendulum, ht. 33 1/2 in. 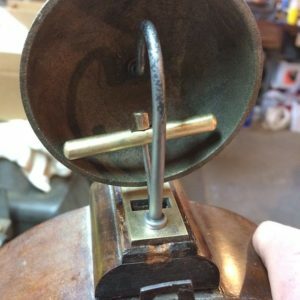 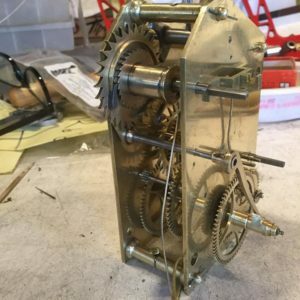 Thanks to the genius of David Lindow this movement in this clock has been professionally restored and is fully functional.